Compact-SUVs are one of the fastest-growing segments in the automotive industry. With both gas and hybrid models, Toyota’s RAV4 is a leader in the space. But with so many features and models, how do you highlight everything a consumer is looking for? 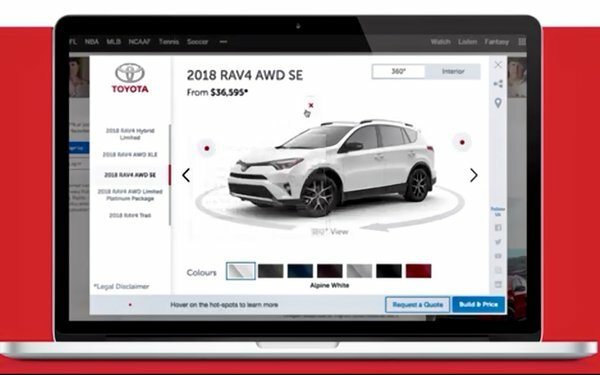 Toyota set out to increase impressions for awareness, engagements for interest, and retargeting and lookalike audiences for decision and action. Toyota chose expandable display for its large-canvas, interactive features and data-collection opportunities. Toyota partnered with the Contobox platform to put their showroom experience inside a display unit. Each model’s section was loaded with interactive features and information, including individual 360º views, interior photo galleries, a color customizer, and hotspots highlighting key features. The unit also featured a dynamic dealer locator and a “request a quote” form to gain more leads. To find new valuable audiences similar to their most engaged users, Toyota used Contobox’s Adobe integration, harnessing machine learning and algorithmic segmentation to create lookalike models. They then activated on the first-party engagement data, dynamically retargeting the most engaged users with optimized creative. Using a cost-per-engagement model, Toyota only paid for 100% viewable engagements from qualified users. This allowed Toyota to build a full-funnel strategy. An independent Nielsen study found that the campaign increased purchase intent by 42% – 9.2 times higher than the auto intent average and 24% higher than Nielsen’s benchmarks for the 90th percentile of all auto intent campaigns. Ultimately, the campaign’s real-time data strategy led to a conversion rate of 2.73% – 129% higher than industry benchmarks. Invest in ways to reach intended targets in real time. Bring the retail experience to online users so they can get all the information they need to make a purchase decision. Build a data and retargeting strategy into the initial execution that allows for personalized creative that targets user interest further down the funnel. Pay only for fully viewable engagements from qualified users. This campaign won a MediaPost OMMA Award in 2018.